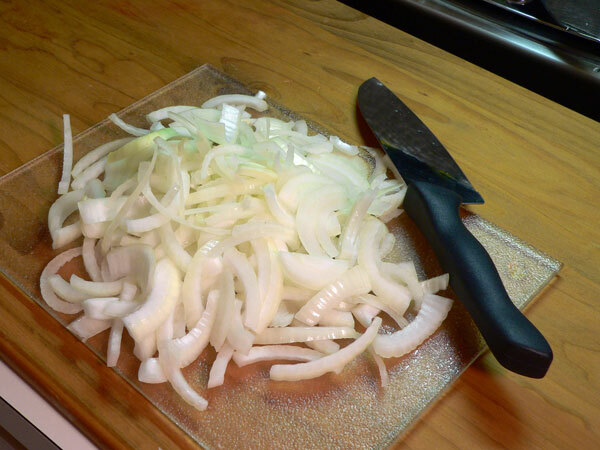 Follow these step-by-step, photo illustrated instructions for our Liver and Onions complete with a printable recipe. I know, its an acquired taste but, it’s certainly worth giving this old southern favorite a try. It’s quick and easy and goes great with rice or mashed potatoes. Liver and Onions is definitely an acquired taste. I just wonder if all the people that seem to be turned off by even the thought of Liver and Onions have ever even tried it. How will you know if you don’t try it? For me, Liver and Onions is one of those things I just like to have “ever so often.” It’s one of those things that you don’t even have to have been thinking about but, you walk into a cafeteria and see it on the serving line and you just automatically say, “Gotta have the Liver and Onions.” Or, you see it on a restaurant menu at some special little Southern style home cooking restaurant and you know… “I gotta have some Liver and Onions.” I can’t even explain it myself but, I know that when it presents itself, I usually end up ordering it. I just gotta have it. I’m more apt to order it out than I am to prepare it at home. However, the same kind of thing happens when I’m walking through the grocery store and spot a package of liver in the freezer section. It just kind of calls my name and, next thing you know, I’m opening the door of that freezer and placing a pack in my shopping cart. Now that I think about it, maybe it has a mysterious pull on me and my brain. Hmmm. Either way, it’s not difficult at all to make Liver and Onions at home. 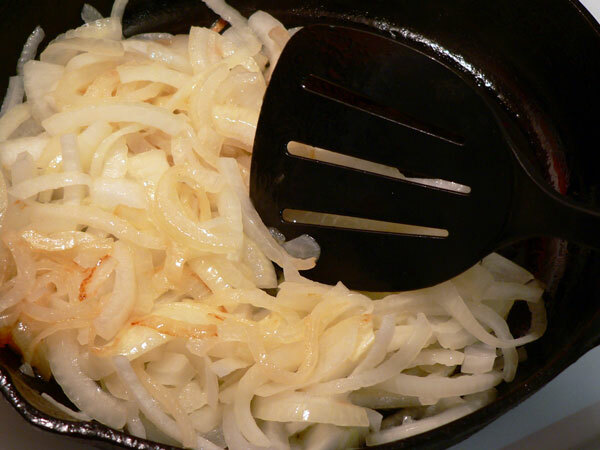 If nothing else, the aroma of those onions cooking up in the cast iron skillet will make your head spin with delight. I do hope you will at least consider giving the recipe a try. I’ve got the full instructions below plus a printable recipe is at the end of this post. It may not be one of the prettiest recipes I’ve done but I’ve tried to take precautionary steps to make it as easy on the eyes as possible. You probably want even notice stuff like that. Ready for some delicious Liver and Onions? Alright then… Let’s Get Cooking! 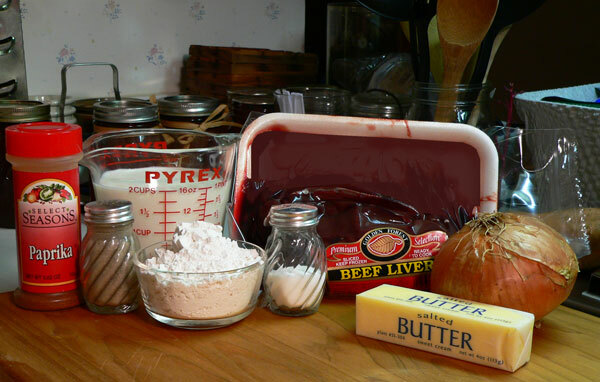 Liver and Onions Recipe: You’ll need these ingredients. Place the liver in a colander and let it drain. Do not try to rinse it, the water will just about wash it all away if you do. It’s very fragile once its been frozen and thawed. Just slide it into the colander and let it drain a little. Raw liver will probably never win any awards for being “Most Photogenic.” Just saying. Some folks soak the liver in milk for about 20-30 minutes before going any further. They say it removes some of that “liver” taste. If you’re sensitive to it, you might want to give it a try. I’ve never done it as I kind of like the taste. 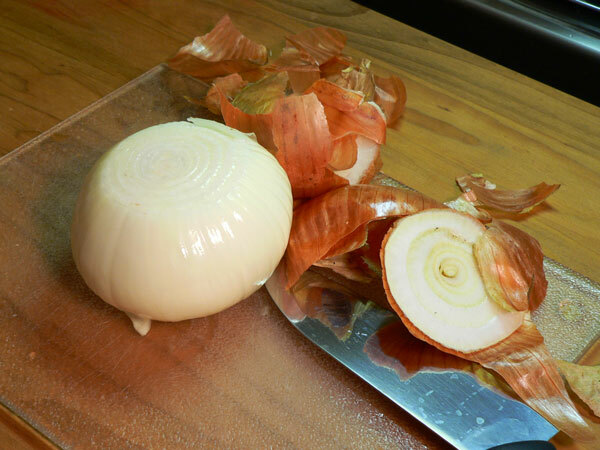 Slice both ends off of your onion and peel away the outer layer of skin. Slice the onion into a gazillion pieces. Place your skillet over Medium heat and let it warm up a bit. Then, add two Tablespoons of Butter to the pan. Place the sliced onions in the pan. It will take about 15-20 minutes for the onions to cook down. Just stir them as needed and, let them become translucent and slightly browned. Watch the heat under them and don’t let them cook too fast or let them burn. Your kitchen should be smelling pretty good about now. I love the smell of onions as they cook, reminds me of the fair. When they’re done, remove the onions and set aside. Place the liver on a tray and sprinkle with Salt, Black Pepper and a little Paprika. Use your best judgement and season to taste. If the liver is getting too soft to handle, you can always pop it back in the freezer part of your refrigerator for a few minutes to firm it back up. Set up a dredge station for the flour by placing it in a container. I’m using one of those Chinese Tupperware plates leftover from one of my take out orders of Sesame Chicken. Take each piece of the seasoned liver and dip it into the flour. Coat each side well, shaking off any excess and place the liver pieces back in the same pan you took them from until you have coated all pieces. You’ll probably have to add a little more butter or some cooking oil to your skillet. You need a thin layer of oil in which to fry the liver pieces. Add the oil, let it warm up until it’s ready for frying. You can test this by dropping a pinch of flour into the hot oil. If it sizzles, the pan is hot enough to start frying in. 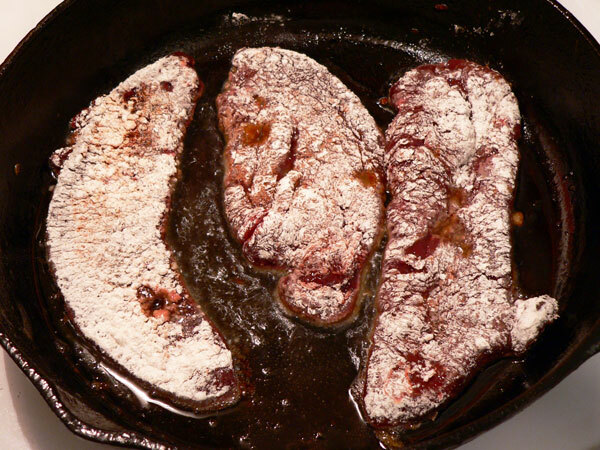 Carefully place a couple of pieces of liver in the skillet and let it cook for about 3 minutes. Use some tongs and lift a piece up to be sure it’s not cooking too fast. Once it’s lightly browned on the bottom, flip it over. Flip the liver over and let the other side cook about 2 or 3 minutes more. Watch it carefully, don’t over cook it or let it cook at hot enough temperature to burn. Burned liver will not be good. You can always cut into a portion of the liver to see if it’s done to your preference. You want to cook it long enough that there aren’t any red juices running out of it and, just to the point of not showing any red when cut open. 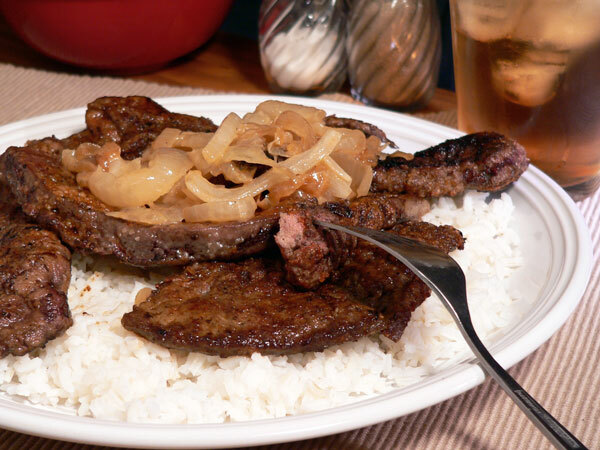 Serve the liver warm over a bed of rice with the onions on top. Or, serve up some mashed potatoes and gravy on the side, either way… it’s gonna be good. Enjoy! NOTE: Some folks like to cook the liver for just a couple of minutes on each side then remove it from the pan. Then, they make a gravy with the pan drippings and return the liver back to the skillet along with the onions. A lid is placed over the skillet and everything is allowed to cook together for about 15 minutes or more until the liver is completely done. I like it that way myself most of the time. Just saying. Follow these step-by-step, photo illustrated instructions for our Liver and Onions Recipe complete with a printable recipe. I know, it’s an acquired taste but, it’s certainly worth giving this old southern favorite a try. It’s quick and easy and goes great with rice or mashed potatoes. ½ cup Shortening or Oil for frying. 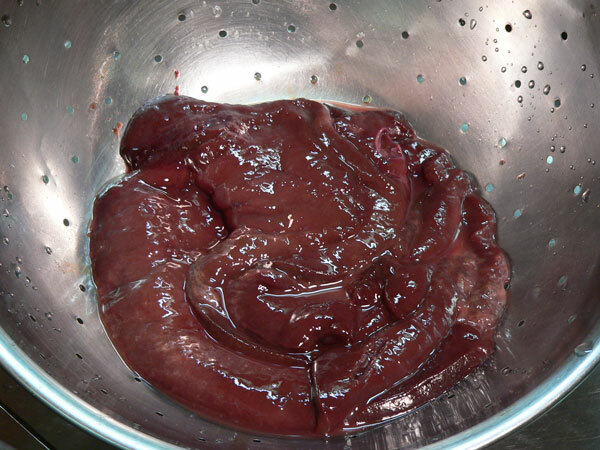 Place liver in a colander and drain. Carefully spread liver pieces out in a pan, set aside. Remove ends and skin from onion. Slice to desired thickness. 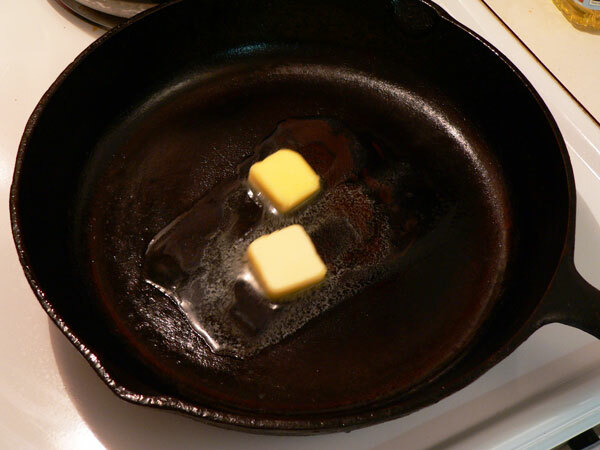 Heat a skillet to medium heat and add 2 Tablespoons butter. Add sliced onions to the skillet. Fry onions until translucent & slightly brown, stirring as needed, about 15-20 minutes. 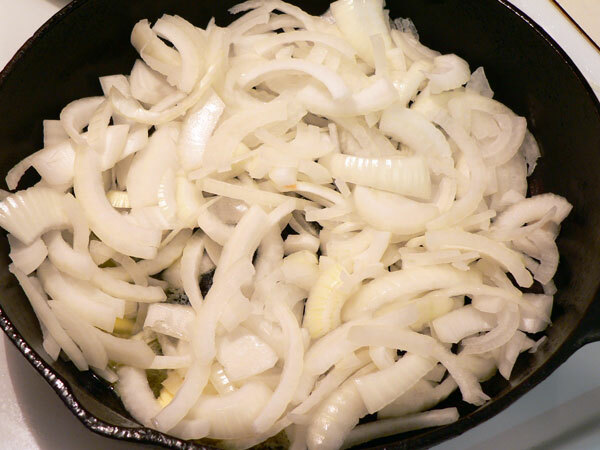 Remove onions from skillet, set aside. 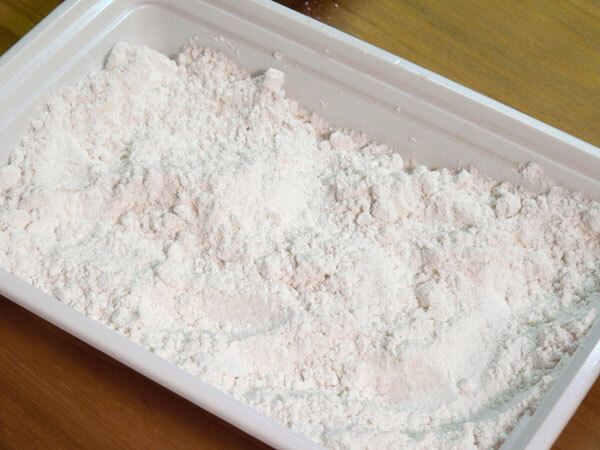 Set up a dredge station by placing flour in a dish or bowl. 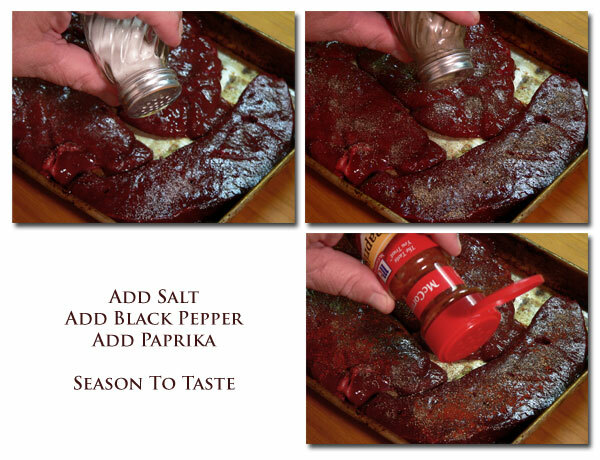 Sprinkle liver with Salt, Black Pepper and Paprika to taste. 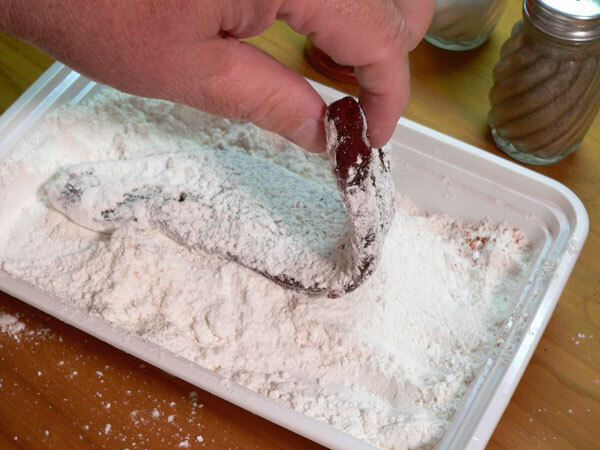 Dredge liver pieces in flour, coating both sides. Shake off any excess and set aside. Add oil to skillet, let warm up for about 3 minutes. 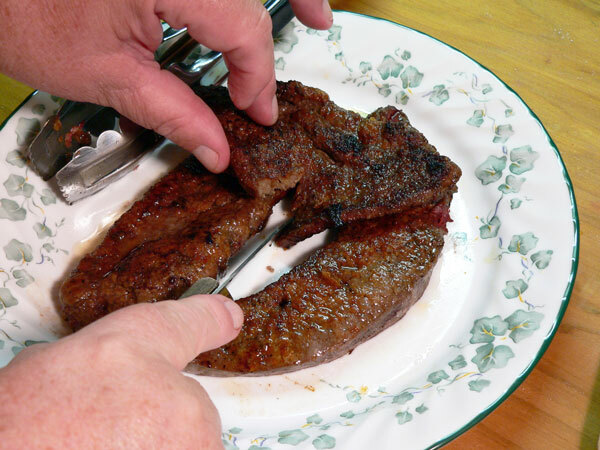 Place liver slices in skillet, brown the bottom for about 3-4 minutes. Flip liver slices over, let brown about 3 more minutes, do not over cook. You may cut a slice of the liver to test for doneness. You may soak the liver slices in milk for about 20 minutes to help remove some of the taste of the liver if desired. Do this before proceeding with the recipe. You can also use the pan drippings to make a gravy. Place almost cooked slices and the onions back in the pan, cover and simmer together for about 15 minutes. Serve over rice or with a side of mashed potatoes. Your Comments: What’s your opinion of Liver and Onions? Have you ever tried them? Think you ever WILL try them? I’d love to hear your comments and memories about our Liver and Onions Recipe. It will only take a minute or two and, maybe it will help someone else to give our recipe a try. Just remember, all comments are moderated. What that means is that I personally read each and every one before it’s approved for posting on our family friendly website. So, take a couple of minutes while you’re here and share your thoughts with us. I also try to reply to as many of your comments as possible so check back soon for that as well. Subscribe to our Newsletter: Before you go, be sure to sign up for our Newsletter. I try to send one out each time a new recipe is added or something interesting is going on around Taste of Southern. It’s absolutely free to sign up and you can unsubscribe any time you change your mind about us. Its just a little reminder of all of our updates, news, giveaways and more. Tell your friends about us as well, I’d greatly appreciate it. My mom would always make creamed peas with liver and onions, which would go on our potatoes instead of gravy. The two things she never made gravy with were fish and liver. 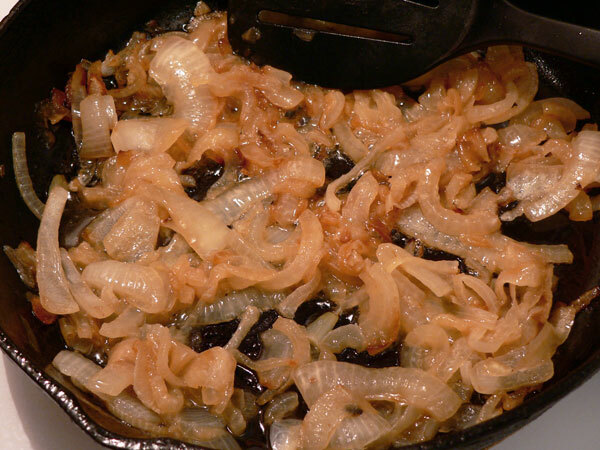 I hated liver growing up (although I had to eat it), but loved the fried onions. I would cut it into the tiniest pieces possible and smother it with onions and potatoes – sneak it under the table to my dog – and occasionally spit it into a napkin. I guess because I did have to eat it though, you could find me ordering it at a restaurant occasionally when I was at college. Once my mom passed away I could never remember whether I was supposed to cook it slow and low or fast and high so it wouldn’t be tough, so I just didn’t cook it. I can tell you probably why this dish seems to just “call” to you once in a while. YOUR BODY NEEDS IT. As you say, it is very nutritious. True story: When my 3 children were growing up,I would prepare it about every two weeks, a lot like your recipe, and the kids would always say, oh no, yuk, make a face, etc. We would promise them homemade ice cream for dessert. But when they sat down and started eating it, they gobbled it up, and I could see they really liked it. (Just never would admit it.) Their little bodies actually NEEDED it! Sometimes they were too full for the ice cream. Wasn’t our Creator smart? Made it exactly as you did except the gravy, but only because it smelled so good…oops down it went. Oh, and I used calves liver. So very good, much better than my mother’s burned black and blue then doused with soy sauce exceedingly rare/raw. I loved it. I would like to share my recipe for Liver and Onions with you for taking away the strong liver taste or pan fried bitter taste. I salt and pepper the liver, dredge it in flour and brown both sides of meat, just till it’s barely browned but not done over medium heat. I then place it in a oven proof glass pan and place the sliced onions on top. I pour enough water in dish to about half way up meat but not covering the meat and onions. I then cover dish with tin foil and bake in oven at 350 D for about 30 minutes or so until done depending on how much liver is in pan and onions are tender. I wouldn’t make this dish any other way. I never get any complaints and any left overs, if there are any, are good cold. I forgot to say there is usually enough gravy to go with mashed potatoes. Enjoyed your liver recipe, I too make mine in bacon grease like the flavor. My question is do you have a liver pate recipe to share? Hi Steve, Here are 3 tweaks to your recipe. I promise the results will make you think you are eating filet mignon. Soak liver in milk for a couple hours. Thanks for the great recipe! The freezer tip was really helpful, I had never heard that before! Animals store the minerals they take in in their livers. With the lack of mineral in today’s vegetables for various reason of modern farming this is a tasty mineral supplement that is healthy for us all. This was magnificent! Thank you! bacon was rendered down until it was crispy crunchy and the fat was used to cook the liver and the bacon strips was crumbled up and added to the milk gravy. Probably to conceal the taste of the liver, but we all loved it. Believe it or not, there is a dish very similar to this in Malaysia too. Yummy! I love liver and onions! When I was a child probably 38 years ago. I had low iron count and the doctor said, I needed to eat liver at least 1 -2 a week. ( Doctors didn’t push medicine as much in those days)I guess this helped me develop a love for it. This is a great recipe. I like spicy food so I do add a little cayenne pepper too not enough to make it hot but enough to give it a little spice. delicious pate for great crackers as well. I made this for dinner and it was delicious!!! Thank you so much for sharing the recipe. I use premium crackers all smashed up instead of flour after I soak the liver in milk. My Mom & Dad love it, oh and of course onions gotta have those onions. Liver is very nutritious. When a mountain lion makes a kill it will immediately eat the liver. After that if its a large carcass like a deer it will move it to a hiding place for later meals. I love this! It’s almost identical to my recipe. I love that you put how fragile liver can be and I love the tip about throwing back into the freezer. I usually season my flour though and not my liver. I’m going to try seasoning the liver tonight. Great recipe, now please some suggestions for side dishes besides mashed potatoes? Not bad. I like my way a little better: Start by cooking up a rasher of good bacon. Remove and do the onions next, slowly and carefully, adding some butter if needed. Remove and set aside for the moment. Heat up the pan, Hot! Make sure there’s enough grease. Flash fry the flour coated pieces of that lovely, tender Calve’s Liver on both sides. Remove from pan. Layer in the pan as follows: the Bacon, one half the Onions, the Liver, rest of the Onions, and top it off with a generous dollop of White Wine (I prefer white Vermouth). Cover tightly and cook over LOW heat until the meat is done to your liking. Serve with mashed potatoes or rice and a green veggie. Enjoy! Oh! It’s worth the attention to detail, so go for it! Love adding depth to recipes, and so this is it for me. I also love white vermouth, so this is just sounding better and better. Definitely making this tonight for my boo and I. Thanks for a very professional page, great photography. I always wonder if my dish looks like it’s supposed to, the pictures help. I LIKE LIVER. Thanks for the reminder of how to coat the liver for frying. It has been so long since I made it I couldn’t remember if it was just flour or if you added milk with it. My family has loved liver and onions. So much so my son at 6 years old ordered it at a restaurant one time. He could order anything he wanted and requested liver and onions. You should have seen the look on the waitresses face when he said this. He ate every bite. Teach a child what good food is at a young age and they’ll love it for life. I’m making it tonight for my son. Once you’ve had real good Southern cooking there is no going back. Will try this recipe. Really sounds good, with the gravy, of coarse. When growing up, I couldn’t stand liver. Guess I was just spoiled, The Army broke me of that and I eat liver and onions every chance I get now. I grew up on liver & onions. My dad owned a small town grocery store so we had to eat what didn’t sell. I fix mine the same as you except I fry bacon first and fry the liver in the bacon grease. Probably not so good for me but it sure tastes good. Now that I’m a grandmother to some hunters, I fix venison steaks the same way. The bacon helps cover the wild taste, if there is any. 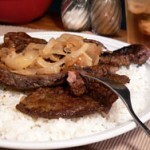 I love liver and onions, though I only cook it a few minutes on each side to make it rare to medium rare. Nothing worse than overcooked liver. Plus I was always told its more nutritional that way.I too love a smothered style with lots of gravy for putting on steamed rice. Cheers to you and your recipe and for bringing such a wonderful dish back into the spotlight. It’s a dish the younger generation should definitely try. 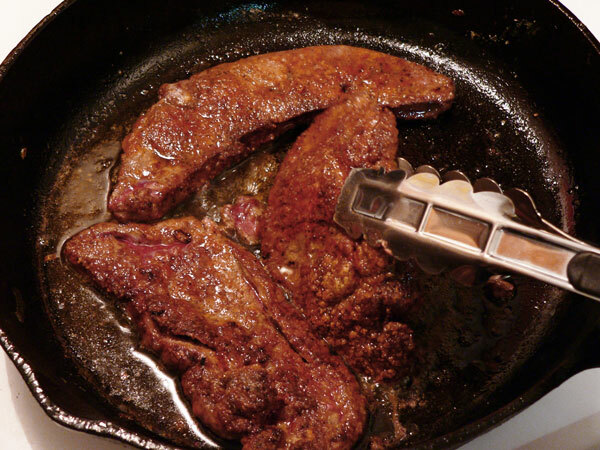 Also I use bacon drippings to fry the liver for extra flavor. I haven’t had liver that I actually enjoyed since I left home! I cut the liver into 1*1 inch pieces so each bite was well flavoured. how do you prepare the pan gravy? Hi Marie, Thank you for the question. Please take a look at my Chicken Fried Steak Recipe with Gravy. You can click the link and go right to it. Scroll down to where I take the meat out of the pan, and follow the same steps to make the gravy. I’d just cook the liver for a few minutes as suggested, then make the gravy, add the liver back in, and let it simmer until the liver is cooked through to your liking. Please let me know if you try it. I appreciate your visit, and I hope you’ll visit with us again… real soon. Be Blessed!!! Steve PS: Thank you for trying the Liver and Onions recipe. I tried this tonight and we just loved it! I and a member of the: I love it and have to have it every so often! Should eat it more! I’m glad I followed your directions – as in the past, I over cooked the liver. Tonight’s was perfect! I am anxious to try a different seasoning besides the paprika. Suggestions, anyone? Tarragon? Thyme? Thank you again for having this “online” for us! I don’t use salt it makes it tough. McCormick’s Perfect Pinch with garlic & herb and black pepper is YUMMY! 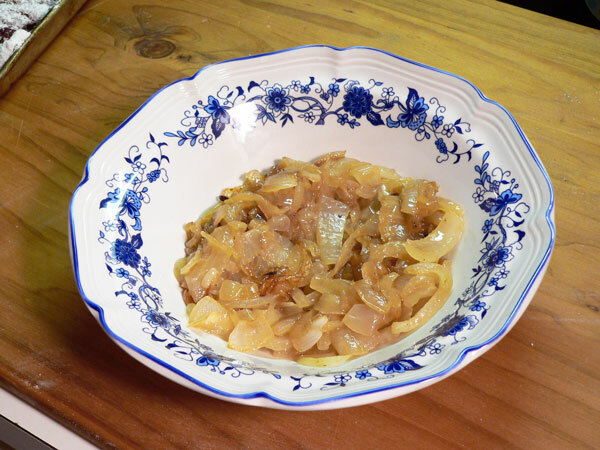 The way for non liver eaters to enjoy liver and onions is to serve applesauce with the liver and onions. Cut small piece of liver, dip in applesauce and also serve Fries. The applesauce cuts the liver taste and is quite pleasant in taste. Eventually eaters will reduce the applesauce once the taste is acquired…. My mom used to serve it with plum sauce which I have yet to add to my cupboard, I’ll have to try it with applesauce! I like mine smothered similar to the way Erica does but I don’t use cornstarch. The flour thickens it up just fine. Man, this has made me really hungry for liver. I had to laugh when you wrote about craving it when you see it; I’m the exact same way. I’d hate to have to eat it every day, but it’s a treat for the “every now ‘n then”. I’ve always been told it’s really good, nutrition-wise, and maybe it’s just a placebo effect, but I always feel stronger after having some. You say to remove the onions from the pan & set aside. When are you suppose to add them back into the pan w/the liver? I quit eating L&O because all the drugs they give feedlot cattle are metabolized in the cow’s liver, and it was not very safe. Now, though, my local health food store sells range fed beef liver and I can eat it again. I highly recommend going this route for safer liver. I live smack-dab in the middle of cattle country in the Texas Panhandle and you’re exactly right. I know feedlot cowboys who won’t touch liver because of that and also have known guys who worked in packing houses who told me horrifying stories of how they’d just cut away the diseased parts of the liver and then send it on down the line to be sent to the grocery stores. I’m lucky enough to have a childhood friend who will give me the liver when they butcher one of their calves from his and his dad’s small cow-calf operation. He won’t touch it, but that’s because he hates the taste and texture. He won’t part with any of the “fries” after they work the young calves, though! Wish I hadn’t read that. When my children were growing up. I made liver and onions every week. They loved it too. your recipes have helped me with several of my childhood favorites, Liver and Onions is one of those that takes me back to Momma’s kitchen table. Good recipe! I love liver and onions and grew up eating them. I’m always looking for new ways to prepare it. I like to add cornstarch and water to mine to make “smothered” liver and have a bit more gravy for my rice or potatoes, but otherwise this is a winner! Thank you~~my liver’sin the freezer along with some chicken livers. Mom would fry her liver but would make liver with gravy for us. This brings back lots of good memories. Hi Neicie, I’m always happy to hear someone say that one of our recipes brings back memories for them. I do hope you’ll let me know how it turns out for you.